Years of tobacco use and soda or coffee drinking can leave the teeth looking yellowed and unattractive. Fortunately, teeth whitening can quickly and effectively transform the appearance of your smile, giving you a rejuvenated look. 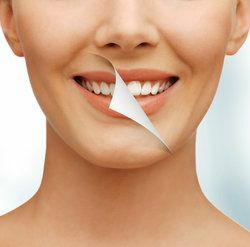 Though both in-home and in-office teeth whitening systems can brighten your smile, many prefer in-office whitening treatment for its quicker results. Albuquerque based cosmetic dentist Byron D. Wall offers the Zoom teeth whitening system to dramatically improve the appearance of yellowed, stained teeth so your smile will look its brightest best. To determine which type of whitening treatment is best for you, in-home or in-office, we welcome you to schedule a consultation with Dr. Wall. In-home teeth whitening systems come in a variety of options. Many use a bleaching gel combined with a special tray worn over the teeth, or whitening strips. The active ingredient in most home whitening systems is peroxide, which create bubbles on the surface of the teeth to help lift away stains. Though each at-home system comes with its own instructions (which should be followed) most require the whitener to be worn daily for about 30 minutes or overnight for up to a week. Whitening systems with higher concentrations of peroxide will produce brighter results. Though tooth whitening is rather safe, using in-home treatments for an extended period of time can cause gum and tooth irritation. For those who experience gum soreness or increased tooth sensitivity after whitening, pain or irritation typically goes away within a few days of stopping whitening treatments. In general, professional in-office whitening treatments yield better results. Dr. Wall offers the Zoom® teeth whitening system because it produces dramatic results in a single 60-minute treatment. Zoom® whitening uses a bleaching gel upon which a special light is applied. The light amplifies the whitening power of the gel to produce a dazzling smile up to ten shades whiter. Like at-home whitening systems, in-office treatments can cause minor gum irritation and increased tooth sensitivity, both of which are temporary. Special sensitivity toothpastes can be used after teeth whitening to reduce dental sensitivity. Both in-office and at-home teeth whitening treatments are relatively safe and suitable for most people. The type of system you choose is best decided between you and your dentist based on your desired results and time needs. In-office treatments are more effective and faster than at-home options. A single in-office Zoom® whitening treatment can whiten the teeth by ten shades in as little as one 60-minute treatment, whereas at-home treatments require daily use for a week or longer to achieve the desired results. At-home whitening treatments can also be used after in-office treatment to maintain results or help brighten the teeth further. Whether you choose in-office or at-home whitening treatment, a bright, white smile can increase confidence and rejuvenate your appearance. To find out which treatment is right for you, we welcome you to schedule a consultation with Dr. Wall today!